The truth is that, when getting started with a business blog, you'll be lucky if anyone reads your first blog articles [except for maybe your mom or best friend]! Experiment with this new digital publishing medium and figure out what works best for you and your business. Figure out your blogging 'voice'. Get articles about your business created and published! 1. Your commitment to the blog and blog topic. 3. Your ability to deliver fresh content consistently. From my observations, momentum begins at about the twenty-four blog article mark. It truly kicks into gear at about the fifty blog article mark. If you publish twice per week, that means that by six months of publishing regularly and consistently you notice respectable signs of success! 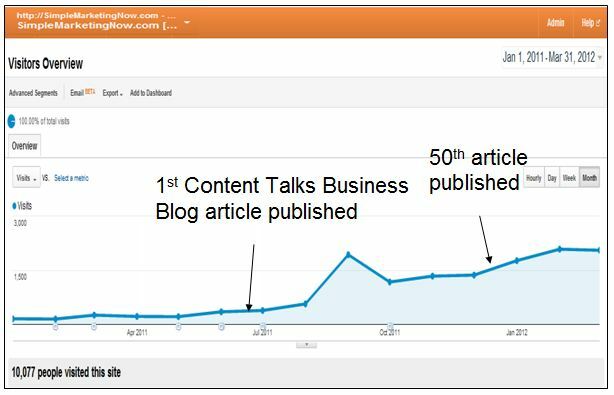 In the chart above, note the traffic stats for the SimpleMarketingNow.com site and the result of having launched a new blog in June 2011, Content Talks Business Blog. I marked the 50th blog article mark. 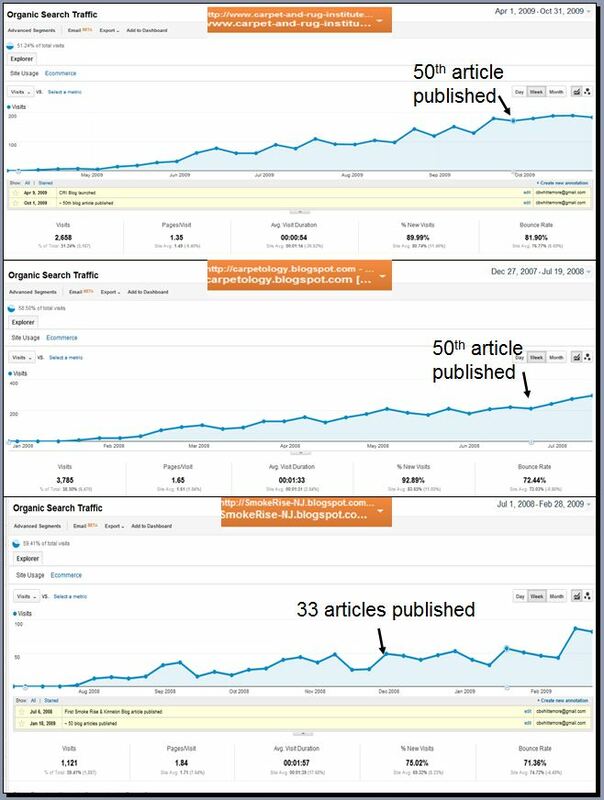 The chart below details stats for 3 blogs: the CRI Blog, the Carpetology Blog and the Smoke Rise & Kinnelon Blog. Although each has different dynamics, the results relating to when each reached the 50 published articles mark are similar. About the 3rd blog shown below. It is personal blog. Articles are published on weekends and inconsistently [I do my best ;-)]. Note how jagged the growth curve looks. What has been your experience when starting a blog? What results have you seen? What patterns have you noticed? What words of wisdom would you offer to someone ready to start a blog for business? If you're ready to get started, I recommend reading 10 Tips for Starting a Blog for Business.